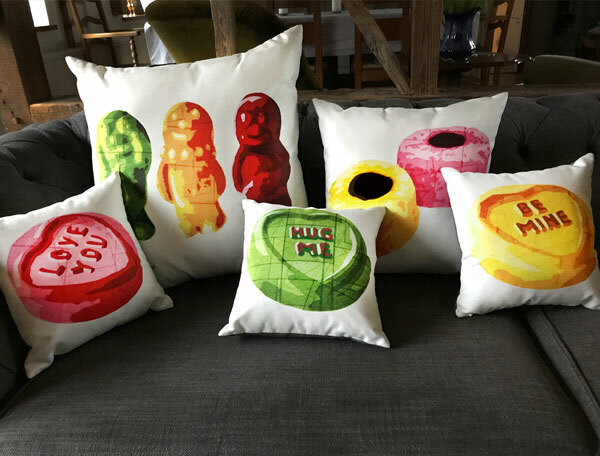 SweetArt’s iconic and much loved sweets images are now on cushions. Throw them on your sofa, your bed, or send to someone you think needs something soft and sweet in their home! Available in 22in (559 x 559mm), 18in (457 x 457mm) and 12in (305 x 305mm) sizes, made of faux suede and complete with cushion insert. The colour fast cover is removable for safe washing. ​Prices include post and packing to UK addresses (allow 7 days for delivery). ​Available in 22 inch (559mm x 559mm), 18 inch (457mm x 457mm) and 12 inch (305mm x 305mm) sizes, they have the ‘For You’ Love Hearts sweets image on the front and a stone grey colour back with zip fastening. ​Available in 22 inch (559mm x 559mm), 18 inch (457mm x 457mm) and 12 inch (305mm x 305mm) sizes, they have the ‘My Favourite’ Quality Street Purple One chocolate image on the front and a stone grey colour back with zip fastening. ​Available in 22 inch (559mm x 559mm), 18 inch (457mm x 457mm) and 12 inch (305mm x 305mm) sizes, they have the ‘Penny’ Quality Street Toffee Penny image on the front and a stone grey colour back with zip fastening. ​Available in 22 inch (559mm x 559mm), 18 inch (457mm x 457mm) and 12 inch (305mm x 305mm) sizes, they have the ‘Ruby’ Wine Gum image on the front and a stone grey colour back with zip fastening. Available in 22 inch (559mm x 559mm), 18 inch (457mm x 457mm) and 12 inch (305mm x 305mm) sizes, they have a ‘Zoom’ Rocket Lolly image on the front and a stone grey colour back with zip fastening. ​Available in 22 inch (559mm x 559mm), 18 inch (457mm x 457mm) and 12 inch (305mm x 305mm) sizes, they have the ‘Dollies’ Dolly Mixture sweets image on the front and a stone grey colour back with zip fastening. ​Available in 22 inch (559mm x 559mm), 18 inch (457mm x 457mm) and 12 inch (305mm x 305mm) sizes, they have the ‘Saucery’ Flying Saucers sherbert sweets image on the front and a stone grey colour back with zip fastening.